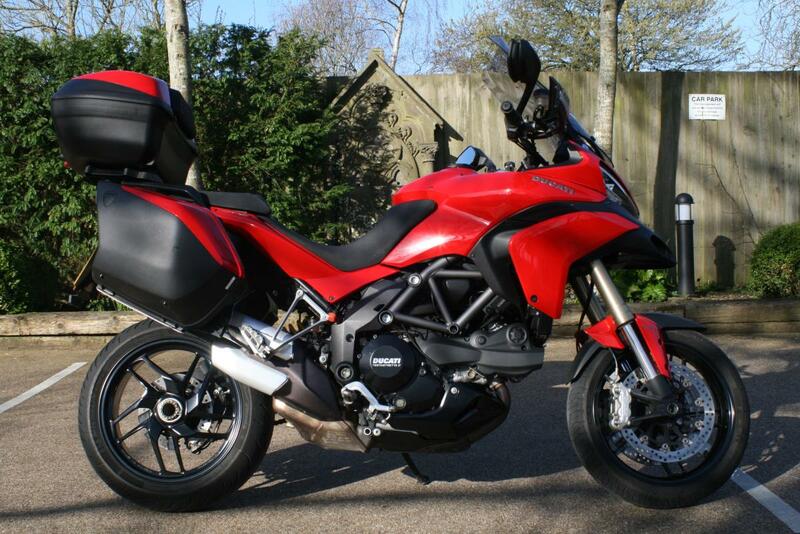 We are delighted to be able to offer you this brilliant Ducati Multistrada 1200. Four owners from new, this bike boasts a full service history and is offered in excellent condition. Fitted with three-piece colour coded luggage, this bike has a go anywhere attitude with looks to match. The Ducati Multistrada was blessed with many traits that make it a desirable motorcycle. It’s agile, lightweight and on top of that is also very good looking. High, wide handlebars, serrated footrests, stylish sump guard and specially designed tyres. Not to mention about the L-Twin cylinder, 4 valve per cylinder, Desmodromic, liquid cooled engine which rewards you with a maximum power of 150 hp @ 9250 rpm and 118.7 Nm of torque achieved at 7500 rpm. Finance is available on this bike, credit subject to acceptance. For a no obligation finance quote please call, 01747 811196 and select option 1 for sales.